Marine parks | "OUR WORLD"
Ontario’s Marineland is home to the Dragon Mountain roller coaster, the Sky Screamer triple tower, and the “Ocean Odyssey” rides. It is also home to more than 4,000 live land and sea animals and a whole lot of controversy. Over the last few years, the “amusement” park has come under public scrutiny for the several high profile marine deaths stretching throughout their nearly 60-year history. According to One Green Planet, over their six decades of operation, the park has seen the deaths of, at least, 17 orca whales, 25 beluga whales, and an estimated 22 dolphins. So bad is their care that at one point even SeaWorld — no hero in animal rights — sued Marineland to get on of their orcas back whose health they claim had deteriorated after loaning it to the Canadian park. Now they can add another victim to their list of animals that died in their care: Zeus the walrus. Zeus was once a fine specimen of a young, vibrant male walrus. But his years in captivity at Marineland had taken a toll on him. No one noticed until a video of one of his performances went viral. The 2016 video showed Zeus to be a mere shell of his former self; he was emaciated and nearly collapsed during one of his performances. But that didn’t stop Marineland from continuing to use him in their shows. In a statement last week, Marineland said that the necropsy performed on Zeus revealed he died of natural causes. But one of Zeus’s former trainers, Phil Demers, isn’t buying it. He told the Dodo that Zeus “had been ill for as long as [he’d] known him” — around 15 years. Whatever the reason, Zeus like Marineland’s other animals should never have been kept in captivity in the first place. These animals are literally dying to be free and we must help. Ask Marineland how many of their animals must die before they realize that what they are doing is animal cruelty. 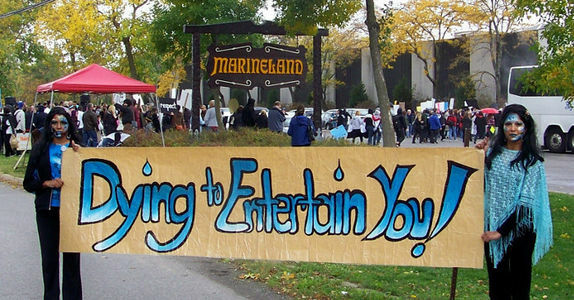 Sign the petition and tell Marineland to end their live animal shows and give their animals to a proper sanctuary. Dolphins have evolved over millions of years, adapting perfectly to life in the ocean. They are intelligent, social and self-aware, exhibiting evidence of a highly developed emotional sense. On the top of the next page, Share the Pledge on your social media to complete the process. I have taken the pledge NOT to buy a ticket to a dolphin show. No Swim With Dolphin Programs. No Hotels and Lodges that feature captive dolphins on the property. No Dolphin “Trainer For A Day” programs. No Dolphin “Research” facilities that charge to interact with dolphins. No Cruise lines that feature stops at Swim With Dolphin Parks. Hundreds of whales are being captured and held captive in inhumane whale jails. Demand that the Russian government take action and stop ignoring this horrific practice. The Seaside Aquarium in Seaside, Oregon, stands around 100 yards from the Pacific Ocean. The sounds of the waves echo against its facade and visitors come and go with sand on their feet. But that short 300-foot walk to the sea might as well be 1,000 miles for the 11 harbor seals the aquarium holds captive. One of Seaside Aquariums biggest draws are these helpless seals that live in a small pool-like enclosure, perhaps 8X5 feet and no deeper than 2.5 feet. Customers can have the “pleasure” of seeing them in their miserable tank and for a small fee you can buy a tray of fish and feed them. The poor seals clap and howl competing for the few bits of fish between the 11 of them. According to one aquarium worker, during the summer this is their main source of food. This is not the way it should be for these beautiful marine mammals or the several other animals that unfortunately call the aquarium home. Seals for one, are extremely intelligent social beings that need stimulation to live a healthy, normal life. In the wild, these animals have the whole of the ocean to call their home but at Seaside they barely have a pool, and a shallow one at that. Seaside aquarium defends their facilities saying that they are governed by USDA standards. But these rules are clearly minimum standards, and even if they aren’t breaking our laws, they are breaking the rules of nature by forcing the seals to live in captivity for their entire lives. It’s time Seaside recognized that it is not OK to imprison marine mammals and use them as tourist traps to line their pockets. Please sign the petition and ask Seaside Aquarium officials to give the seals to a sanctuary where they can live the rest of their life in peace. 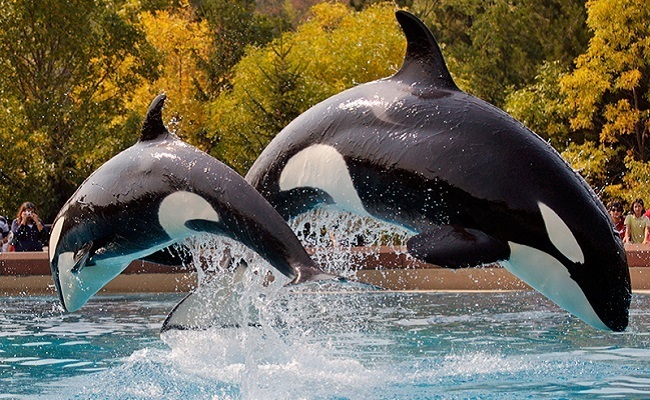 Canada Just Took A Vital Step Forward In Banning The Captivity of Whales And Dolphins. Finally after a three year fight with conservative parties, the Canadian bill “Ending the Captivity of Whales an Dolphin Act” has made its way through Canada’s Senate and onto the House of Commons. Currently there are two current facilities in Canada that harbor the marine mammals, Marineland in Niagra Falls and Vancouver Aquarium. Vancouver Aquarium currently has one Pacific white-sided dolphin named Helen remains at the aquarium. Marineland currently is home to multiple species including the largest beluga whale “collection” in the world. Now, if Bill S-204 is able to be passed through the House of Commons, both aquariums will not be able to continue their whale and dolphin programs. Unfortunately for the mammals currently calling the aquariums home will, they will not be able to return back to the sea as they have lived their whole life in tanks for the purpose of human entertainment. Where the bill will really make a difference is ensuring that no wild dolphin or whale in the future will be caught to replace or fill a tank. In the 21st century there is absolutely no excuse to exploit animals in this way. When the world is waking up to the cruelty and greed of swimming with whales and dolphins in captivity why are we now encouraging the swimming with any captive marine animal? We should be encouraging our children to explore the world and value its wildlife not see it as a way to make a profit. The experience of seeing wildlife in the wild should be our priority. This is not Conservation. It sends the completely wrong message to our children and adults alike. We ask you Bear Grylls to stop this! SeaQuest’s interactive exhibit is an atrocity in the making. With its current construction inside the Southwest Plaza mall, we believe the welfare of the marine life, birds, and other animals will be put at risk. SeaQuest is planning on having over 1200 animals subject to abuse and torture with its opening at the newest location in Littleton. Colorado is a forward-thinking, animal-friendly state that cares about the environment and the planet, this latest addition is not welcome in our state. There is a documented history of repeated criminal convictions involving illegal acquirement and trade of exotic animals, and lying to investors linked to SeaQuest Interactive Aquariums. Employee and customer safety marks from OSHA are on record, as well as eyewitness testimony of abuse, and neglect. These aquariums also see an unusually high mortality rate compared to averages across the country. We believe that Colorado is an amazing state, full of caring individuals who stand against what Sea Quest stands for. It is up to us to stop the construction of this building and to stand up for what is morally right for these animals. We pride ourselves on supporting ethical businesses that bring revenue to the area and educates the public. The Interactive Aquarium by SeaQuest does not meet those standards. For many years, advocates have voiced their concerns about the welfare of the captive animals at Marineland in Niagara Falls, Ontario. In November 2016, the Ontario Society for the Prevention of Cruelty to Animals (OSPCA) filed five animal cruelty charges against Marineland in regard to the theme park’s failure to provide prescribed standards of care for its bears, guinea hens and a peacock. Two months later, the OSPCA filed six additional animal cruelty charges related to the treatment of the park’s elk, red deer and fallow deer. All 11 animal cruelty charges were dismissed in August by the Crown in Provincial Offences Court, which said there was no “reasonable prospect” of conviction for eight of the charges and the other three were “not in the public’s interest” to pursue. But when the OSPCA conducted a surprise inspection of Marineland a week after the charges were dropped, it said it found 11 items requiring action regarding the park’s veterinarians, according to the Niagara Falls Review. Marineland issued a statement saying the OSPCA’s inspection found “no signs of abuse, distress, mistreatment or neglect” of its animals. Two months after the surprise inspection, Marineland has filed a $21 million lawsuit against the OSPCA on the grounds of malicious prosecution, negligent investigation, injurious falsehood, and abuse of power and process. It alleges that the animal charity “maliciously targeted the theme park in order to curry favor with animal rights activists and boost fundraising,” CBC reports. Marineland is “notorious for suing anyone who opposes its cruel facility,” according to In Defense of Animals, which ranked the park at No. 2 on its list of the 10 Worst Tanks for Dolphins and Whales. In 2012, Marineland filed a $7 million libel lawsuit against the Toronto Star for its investigative report about the neglect and mistreatment of animals at the theme park. In 2013, Marineland filed a $1.5 million lawsuit against former employee Phil Demers for “plotting to steal a walrus” after he spoke out against the park’s treatment of animals. It also sued animal activist Mike Garrett for $1.5 million after a series of protests. In 2014, Marineland filed $1.2 million in defamation lawsuits against the Digital Journal and The Georgia Straight for publishing stories about the death of sea lions at the theme park and the health of Kiska, its last remaining orca. Last year, Marineland sued marine biology student Zach Affolter for $1 million because he used images “illegally taken” inside the park in his documentary, “Black Water.” Marineland said the film would “secure income for animal activist organizations and, as such, is for a commercial purpose.” Marineland is never mentioned in the film, which Affolter had intended to post on YouTube for an educational purpose. None of the lawsuits have been settled. Marineland is “leveraging the publicly funded court system in an attempt to silence any criticism they don’t like about their facility,” Garrett said in 2014. And now Marineland wants a whopping $21 million from a charity that protects animals. Hopefully a judge will have the good sense to toss this frivolous lawsuit. There are probably 21 million better ways all that money can be used to help animals instead of putting it in Marineland’s pocket.